Real estate brokers can be sued for many different reasons, but some of the most common lawsuits they can be subjected to are real estate misrepresentation lawsuits. Exaggeration and puffing are common sale tactics in the real estate industry, and so it is important for both buyers of property and real estate brokers to understand the legal boundaries of real estate misrepresentation, including intentional misrepresentation and negligent misrepresentation, to identify what is fair game an what is not. Suing a seller for non-disclosure is a major undertaking, and so it is important to understand what counts as real estate fraud as opposed to puffing. This article seeks to explain various forms of real estate misrepresentation and what makes them improper. What Is Misrepresentation in Real Estate? Real estate material misrepresentation is a legal term that describes a misstatement about a material (important) feature of the property. Misrepresentation claims are very similar to failure to disclose claims. In a failure to disclose claim, the real estate broker will leave out an important detail about the property: for example, perhaps the roof needs to be replaced in the near future but a buyer would not be aware of this because of “cover up” techniques utilized by the seller’s real estate broker and the seller. In property misrepresentation cases, however, the real estate broker will either lie or make up incorrect facts about the property to try and convince the buyer into making a purchase. The most commonly misrepresented areas of a property are the foundation, the stability of the structure, the extent of property boundaries, or the existence (or lack of) pest or termite problems. The most commonly undisclosed issues relate to easements over the property and problems with title. What Is an “Innocent” Misrepresentation? the purchaser suffered pecuniary loss as a result of his justifiable reliance. Do not be fooled by the name. Innocent misrepresentations are not so innocent and have the a very similar legal effect to negligent misrepresentations. A real estate broker makes an innocent misrepresentation when he or she makes a material statement about the property that he or she believes is true; however, the statement is actually false. For example, if a real estate broker who believes he or she is not lying tells a buyer that the property has never had termites but the property currently has a termite infestation, that constitutes an innocent misrepresentation. Of the three categories of misrepresentation, innocent misrepresentations are both the most common and the hardest to prove. Because any misrepresentation may be an innocent misrepresentation, it is important to consult an experienced real estate attorney before filing a lawsuit. The real estate lawyers at the Law Office of Yuriy Moshes can help you determine if you have a valid claim. the broker’s misrepresentation or nondisclosure was the proximate cause of the harm. Like an innocent misrepresentation, a negligent misrepresentation claim does not necessarily imply that the real estate broker meant to lie to the buyer. Instead, a negligent misrepresentation occurs where a real estate broker makes a statement about the property without having any idea at all whether the statement is true or false. For example, if a real estate broker is trying to sell a house in New York City next to a construction site and the buyer asks how tall the new building will be, the real estate broker is not allowed to guess or claim that the view will not be blocked without knowing whether that statement is actually true or not. A negligent misrepresentation can also occur if the real estate broker forgets to mention an important fact about the property when he or she is asked about it. What Is a Fraudulent Misrepresentation? A fraudulent misrepresentation is the most serious form of misrepresentation and only occurs either where the seller intentionally lies about the property or makes a recklessly uncertain statement about the property. An intentional misrepresentation in real estate is an actual lie. In other words, if the real estate broker is asked about pest problems and he or she lies, that is a fraudulent misrepresentation. This includes the convenient editing or photoshopping of pictures of the property to remove unsightly things that are really there such as mold stains or power lines. Intentional non-disclosure also falls within the category of fraudulent misrepresentation. As described above, a negligent non-disclosure occurs when the real estate broker leaves out important information. For example, assume a buyer asks about whether the structure has a termite problem. If the real estate broker tells the buyer that the structure was treated for termites a year ago but leaves out the fact that the termites have recently returned, that type of omission also constitutes a negligent misrepresentation. The more difficult area of fraudulent misrepresentations to understand are recklessly made statements. Recklessly made statement are made when the real estate broker makes a statement with a reckless disregard as to whether the statement is true or not (in other words, the real estate broker doesn’t care whether the statement is true or false because the broker is trying to move the property at all costs). For example, if the real estate broker is asked if the property was recently checked for pests and the real estate broker says “yes” without doing any sort of investigation or follow-up, that would be a fraudulent misrepresentation. This is different from the construction site example because the real estate broker probably should know about the real status of a pest inspection on the property. This difference between misrepresentation and fraud is confusing, and is best explained on a case-by-case basis in the context of the misrepresentation claim the buyer is making. One final fact about fraudulent misrepresentation is that because it is considered a more egregious offense than other forms of misrepresentation, it is treated differently by courts when the claimant asks for damages. Generally, in claims of fraud, the real estate broker is going to be directly liable for fraud because insurance carriers will not cover fraudulent acts. Additionally, punitive damages may be available in the context of fraud where the misrepresentation was intentional. 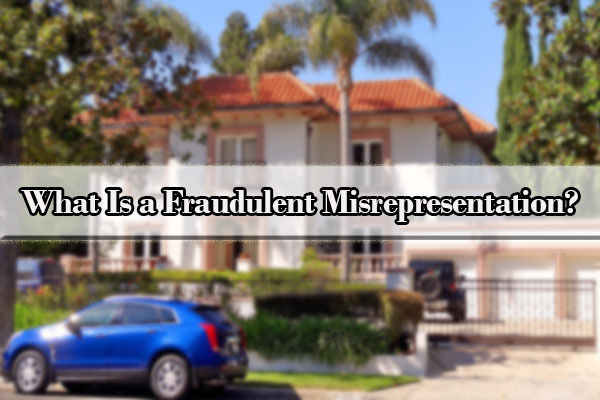 For additional information about whether your misrepresentation claim is negligent or fraudulent, contact the Law Office of Yuriy Moshes to consult with an experienced real estate lawyer. There is no real estate misrepresentation law that protects either real estate brokers or home buyers. Instead, real estate misrepresentation law is based in common law tort traditions. This means that real estate misrepresentation issues are ruled on by the courts and decisions are based primarily on judge-created rules. That said, some legislature-created statutes do affect issues of real estate misrepresentation. 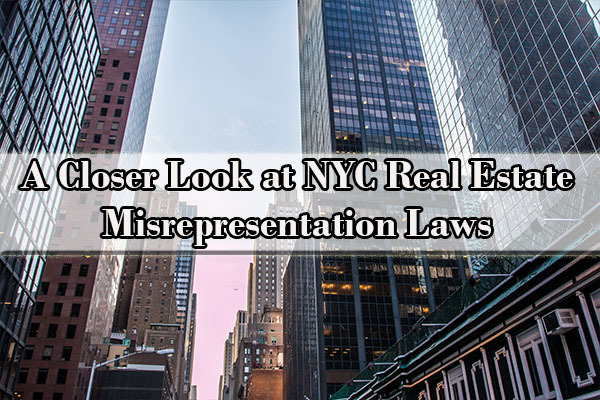 The most relevant law in New York to real estate misrepresentation issues is the Property Condition Disclosure Act (the PCDA), which applies to the sale of residential real property. Under the PCDA, residential real property is a one-to-four family dwelling that is used as a home. ‘the term does not include condominium or cooperative apartments. As most information about the property will ultimately be obtained from the seller, the PCDA requires the seller to make a disclosure statement to the buyer about the property’s condition. Alternatively, the seller can pay the buyer a $500.00 credit at the property closing. The real estate broker is responsible for reminding the seller to make the required disclosures. The required disclosure form should always be attached to the final, signed purchase contract. General Information: includes information about the age, ownership, utility surcharges, and possession of the property. Environmental: includes location and topographic related information such as whether the property is located within a flood plain, wetlands, or if the property is near a landfill. Additionally, the disclosure requires the seller to provide information about whether the property contains asbestos, lead pipes, radon contamination, hazardous materials contamination, and the existence of petroleum products or fuel storage tanks. Structural: requires disclosure of prior damage to the property including water, fire, smoke, insect, or roof-related damage. Mechanical Systems and Services: includes information about utilities, water source and quality, sewers, drainage, and flooding. Finally, the disclosure requires the seller to state any known defects in plumbing, air conditioning, heating, hot water, security systems, the foundation, walls, sump pumps, chimneys, patios, decks, or driveways. For real estate brokers, the key line between misrepresentation and a legal sales tactic is “puffery.” Basic exaggeration in the form of an opinion is not illegal. This is because a material misstatement must involve a material fact about the property. Making a misstatement of fact is almost never worth the risk of a misrepresentation lawsuit. Instead, real estate brokers should leave all exaggeration in the form of an opinion to limit any possible liability. Next, if a real estate broker receives information about the property from a third-party source such as the property owner or a property survey, the real estate broker should attribute that information to the source. This can shield the real estate broker from liability by identifying the true source of any false or misleading information early. Much of this can be accomplished by providing the buyer with a thorough, rather than a vague or an incomplete, disclosure statement. However, to fully shield themselves from any liability for misrepresentation, real estate brokers should verify any information that they receive from other parties. If the broker discovers any mistakes, the broker should correct the false information as soon as possible. If you are concerned about a possible misrepresentation claim, you should also contact an attorney to receive advice on how to proceed and head off litigation. The case of Beckman v. Wells Fargo provides a good example of real estate misrepresentation claims because it covers a lot of topics discussed here in this article. The Beckman case involved the resale of a home in foreclosure in Minnesota. The real estate broker accused of misrepresentation relied on several statements provided by the bank and a local government website to provide information about the property in an online real estate offering. The online offering described the property as in good condition and bordering 1,500ft of lakefront property. The buyers chose to purchase the home without surveying or inspecting it. When they moved in; however, the buyers discovered massive amounts of mold contamination, and the lakefront edge of the property line was only half as long as claimed. So why did the real estate broker win this lawsuit? First, the real estate broker’s statement about the property as being in “good condition” is primarily a statement of opinion rather than a statement of fact. The real estate broker did not know about the mold and he never claimed there was no mold. He simply said the property was good in a vague sense. Second, the real estate broker properly attributed the statement about the lakeshore property line to the local government website where the real estate broker received erroneous information. These tactics protected the real estate broker from legal liability. What Should a Broker Do When Faced with a Misrepresentation Claim? Even the most careful of real estate brokers can face misrepresentation lawsuits. If this occurs, you should immediately seek legal advice. Contact the experienced real estate attorneys at the Law Office of Yuriy Moshes. Consulting a legal expert can help you decide the best course of action under the circumstances. 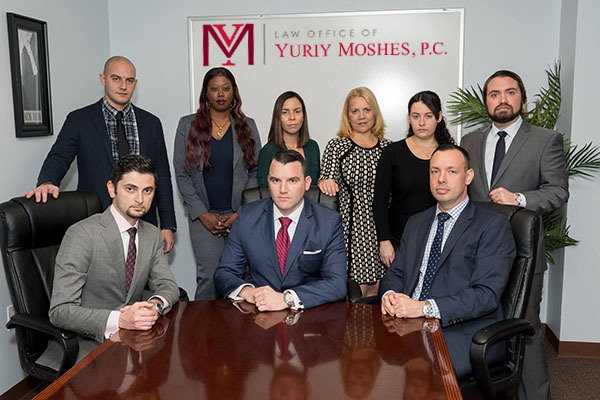 The Law Office of Yuriy Moshes is a full service real estate law firm serving clients in the greater New York City area including all the boroughs of New York City (Manhattan, Brooklyn, Queens, the Bronx, and Staten Island) as well as Northern New Jersey, upstate New York, and Long Island. If you discovered that you have made a mistake while selling a property which may be considered a misrepresentation, contact us immediately for a free consultation. Have you ever faced a claim from an unhappy real estate buyer regarding a misrepresentation? If so, how have you resolved issues with the client? Did your case result in litigation? We would appreciate the opportunity to hear any other advice that you may have regarding misrepresentation claims.